Mars and Saturn – Mars and Saturn are visible in the WSW sky during early evening hours. The two are joined by the bright 1st magnitude star Spica. The three are similar in brightness with the brightest being Saturn at magnitude +0.8 followed by Spica at magnitude +1.0 and Mars at +1.1 to 1.2. Saturn moves slowly relative to the stars and will be within 5° of Spica all month. Mars is moving much faster. At the start of the month Mars is ~7° of Saturn and Spica. On the 13th and 14th Mars passes in between Saturn and Spica. The three will form a nice line only ~5° long on those evenings. The Moon joins to make a quartet on the evening of the 21st. Jupiter – The largest planet rises around 1-2 am at the start of the month and around 11 to midnight at the end of the month. At magnitude -2.2 to -2.3 it is much brighter than the evening planets. Jupiter is currently moving slowly through the constellation of Taurus. The Moon is nearby on the mornings of August 11 and 12 (the night before and the night of the Perseid peak). Venus – Venus rises about 3.5 hours before the Sun this month. In fact, on August 15 it is at Greatest Elongation from the Sun. In a telescope the planet will appear half-illuminated. The Moon is close by on the mornings of August 13th and 14th. The Moon passes so close to Venus that it actually passes in front of the planet for all of Mexico and the United States and all but the extreme NE corner of Canada. The event can also be seen from Japan, the Koreas, NE China and eastern Siberia. In the United States, the occultation is visible during the late afternoon on August 13. The Moon and Venus will be very low in the sky for eastern observers. The view is easier towards the western half of the country. Mercury – The innermost planet is too close to the Sun for easy observation at the beginning of the month. By 2nd week of August it is rapidly climbing out of the dawn twilight. Use the Moon to spot Mercury on the morning of the 15th (Mercury to the lower left of the Moon) and 16th (Mercury above a very thin crescent Moon). The year is usually split in 2 with January through June having low rates with few major showers while July through December have high rates with many major showers. Meteor activity is at an annual peak this month. Sporadic meteors are not part of any known meteor shower. They represent the background flux of meteors. Except for the few days per year when a major shower is active, most meteors that are observed are Sporadics. This is especially true for meteors observed during the evening. During June mornings, 7 or so Sporadic meteors can be observed per hour from a dark moonless sky. The Perseids are one of the 2 annual showers worth getting up early for. This year the peak will occur on the morning of August 12. The Moon will be up at that time though it shouldn’t hamper meteor watching too much. Recent IMO observations found the timing of the mean or “traditional” broad maximum varied between λ⊙ ∼ 139.8° to 140.3°, equivalent to 2012 August 12, 07h to 19h30m UT. No additional peaks are anticipated this year, but this does not guarantee what will occur! Although the Moon is a waning crescent, three days after last quarter on August 12, it will rise from mid-northern locations around local midnight to one a.m. Its brightness and relative proximity to the Perseid radiant should be considered more of a nuisance than a deterrent, even so. Such mid-northern latitudes are the more favored for Perseid observing, as from here, the shower’s radiant is usefully observable from 22h—23h local time onwards, gaining altitude throughout the night. The near-nodal part of the “traditional” maximum interval would be best-viewed from eastern Asia east to far western North America (with increasing moonlight for places further east in this zone), assuming it happens as expected. All forms of observing can be carried out on the shower, though unfortunately, it cannot be usefully observed from most of the southern hemisphere. The best time to look will be after about 1-2 am on the night of August 11/12. Meteors will appear to radiate from the constellation of Perseus in the northeast sky. Over the past five years, the Perseids have peaked with zenithal hourly rates (ZHR) of 58 (in 2011), 91 (in 2010), 173 (in 2009), 116 (in 2008) and 93 (in 2007). These are the rates that would be seen under perfectly dark skies, with no Moon and with the radiant overhead. In reality these conditions are never really met especially if you live anywhere near a city. Still observed rates of 20-40 meteors per hour are possible even under suburban skies. 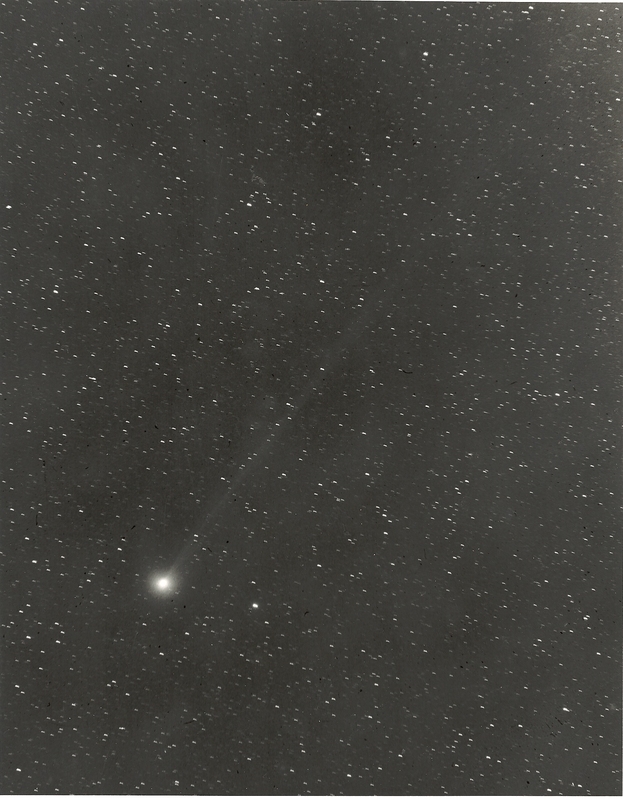 Comet Swift-Tuttle observed with the University of Arizona Catalina Schmidt in 1992. This is a scan of a photographic image taken by Tim Spahr and Carl Hergenrother. Credit: Carl Hergenrother/Tim Spahr. The best time to look will be after about 1-2 am on the night of August 12/13. Meteors will appear to radiate from the constellation of Perseus in the northeast sky.